In this post, I want to report some data that may lead people to question this common narrative. Note, I am not saying that there is no element of truth in the interpretation (maybe there is, maybe there isn't). And I do not want to question the likely bad effects that come about owing to a large unexpected deflation (or inflation). What I want to question is whether a period of prolonged moderate (and presumably expected) deflation is necessarily associated with periods of depressed economic activity. Most people certainly seem to think so. But why? Following the end of the U.S. civil war, the price-level (GDP deflator) fell steadily for 35 years. In 1900, it was close to 50% of its 1865 value. In the meantime, real per capita GDP grew by 85%. That's an average annual growth rate of about 1.8% in real per capita income. The average annual rate of deflation was about 2%. I wonder how many people are aware of this "disaster?" 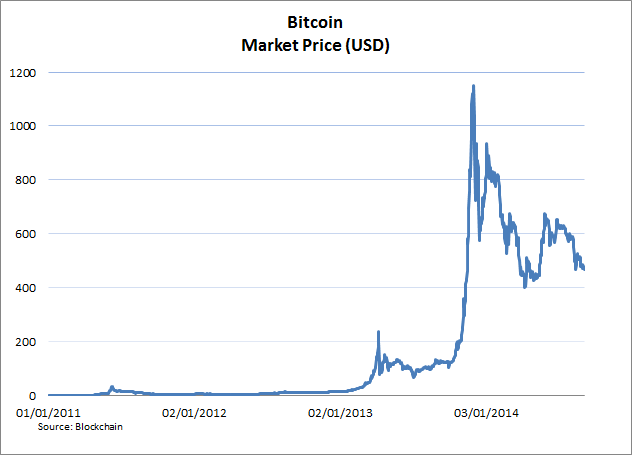 Over this five year period, the price level is up about 7% in the United States and about 11% in the United Kingdom. 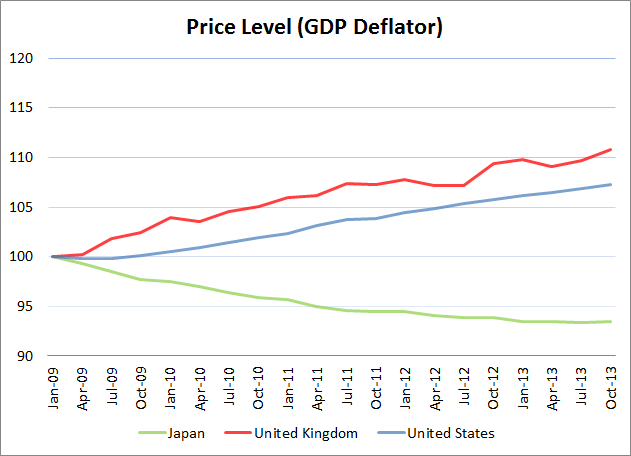 As for Japan, well, we all know about the Japanese deflation problem. Over the same period of time, the price level in Japan fell by almost 7%. Now, I want you to try to guess what the recovery dynamic--measured in real per capita GDP--looks like for each of these countries. 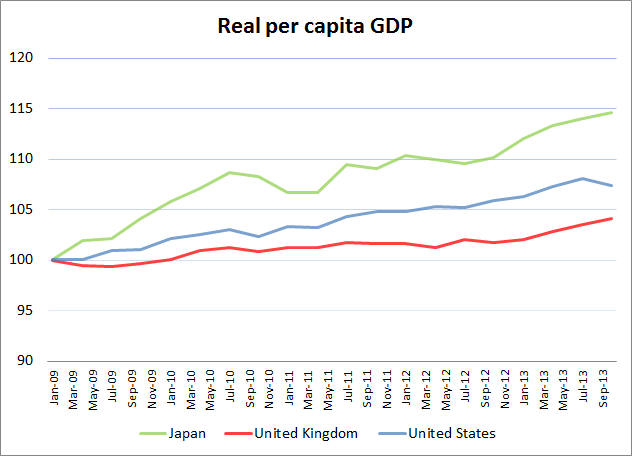 Surely, the U.K. must be performing relatively well, Japan relatively poorly, and the U.S. somewhere in the middle? But you would have mixed up the U.K. with Japan. Since the trough of the past recession, Japanese real per capita GDP is up 15% (as of the end of 2013)--roughly 3% annual growth rate. Is deflation really so bad? Maybe the Japanese would like the U.K. style inflation instead? I don't get it. I have some more evidence to contradict the notion of deflation discouraging spending (transactions). The evidence pertains to Bitcoin and the data is available here: Blockchain. Many people are aware of the massive increase in the purchasing power of Bitcoin over the past couple of years (i.e., a massive deflationary episode). As is well-known, the protocol is designed such that the total supply of bitcoins will never exceed 21M units. 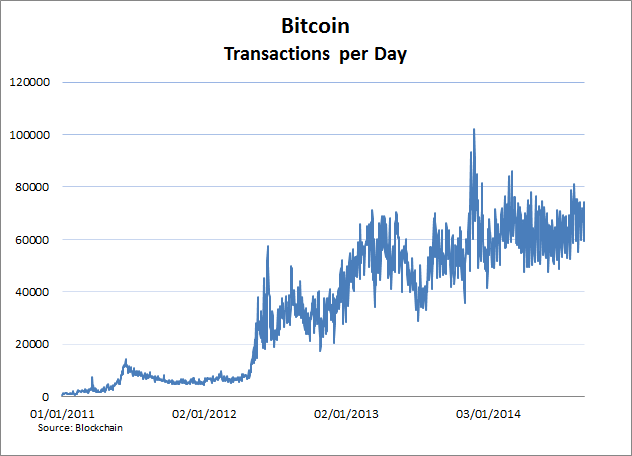 In the meantime, this virtual currency and payment system continues to see its popularity and use grow. Maybe deflation is not so bad after all? Let's hope so, because we may all have to start getting used to the idea! Good vs. Bad Deflation: Lessons from the Gold Standard Era (Michael Bordo and Angela Redish). 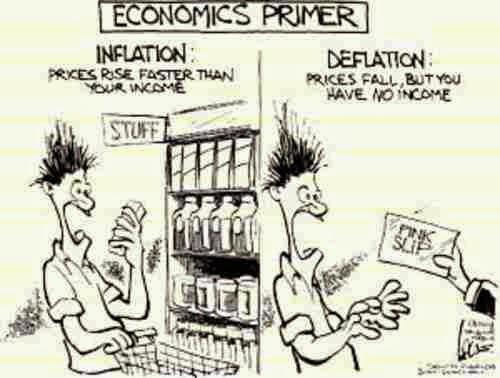 Deflation and Depression: Is There an Empirical Link? (Andy Atkeson and Pat Kehoe). 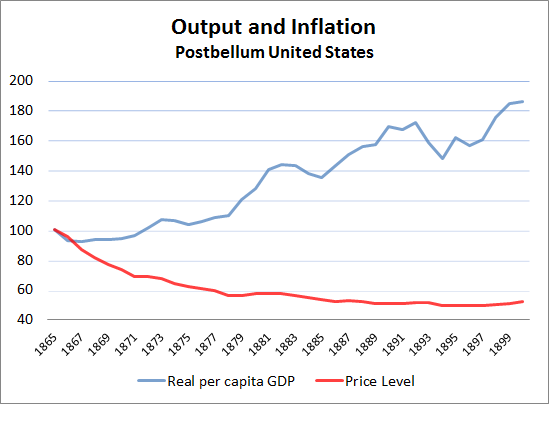 The Postbellum Deflation and its Lessons for Today (David Beckworth).